The Halo Bassinest is such a great addition to my life. Whether you’re on your first baby or your third, newborn sleep is one of the biggest challenges of your parenting life. With my first son, I obsessively read up on safe sleep practices and carefully selected a bed that was rated for overnight sleep. While it was true that my son was safe and close by, I found that I had to either position him far away from me so I could comfortably get into bed and then pop up to check on him every time he sighed in his sleep OR position him close to me and getting in and out of bed using maneuvers lifted straight from Mission Impossible action sequences. With my second son on the way I looked into other options on the market that would allow me to employ safe sleep practices but also offer convenience that would ensure we would both have a restful night. What started as a quest to find a more convenient sleep solution for my bedroom led me to one of the greatest weapons in my newborn sleep arsenal: the Halo Bassinest Swivel Sleeper. The Halo Bassinest Swivel Sleeper Premier is packed with features to make your nights easier. The Halo Bassinest features a nightlight, 3 soothing sounds, 3 lullabies, a nursing timer, two levels of vibration and 2 storage pockets so a clean diaper or pacifier are always close at hand. 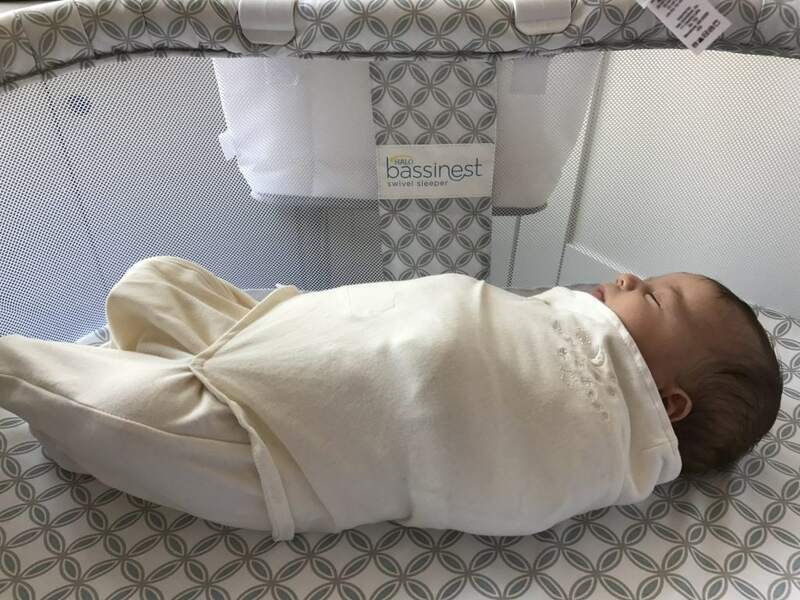 The Bassinest is easy to adjust to fit beds from 22″ to 34″ and is recommended for babies up to 5 months old or 20 pounds. The Halo Bassinest Swivel Sleeper comes in a variety of colors and styles. The Essentia series retails for $199.99, the Premier series retails for $249.99 and the Luxe series retails for $279.99. My favorite feature is how easy it is to swivel and allows me to get in and out of bed without disturbing my little man. The 360 degree swivel means it is easy to bring your baby over to you for close, safe sleep and it is also easy to swivel baby away for easy access in and out of bed for mom. I also love how the sidewall lowers so you can attend to baby without having to get up so you both can get back to sleep without a lot of production. The easy swivel feature also makes the Halo Bassinest ideal for a mom recovering from a C-section. I don’t know what I would have done without my Halo Bassinest. As if the features of the Bassinest weren’t fantastic enough on their own, Halo also has a range of accessories to make your sleep experience even better. The Halo Bassinest Swivel Sleeper Mattress Pad Cover (pictured above, left) and Fitted Sheet (pictured above, right) are designed for a snug and safe fit on the Halo Bassinest mattress and both are machine-washable. Tiny babies require a lot of stuff, even at bedtime and there’s no better way to keep diapers and pacifiers and other necessities close at hand than the Caddy. The Caddy (pictured above, center) attaches to the side of the Bassinest for easy access to all your middle of the night necessities. 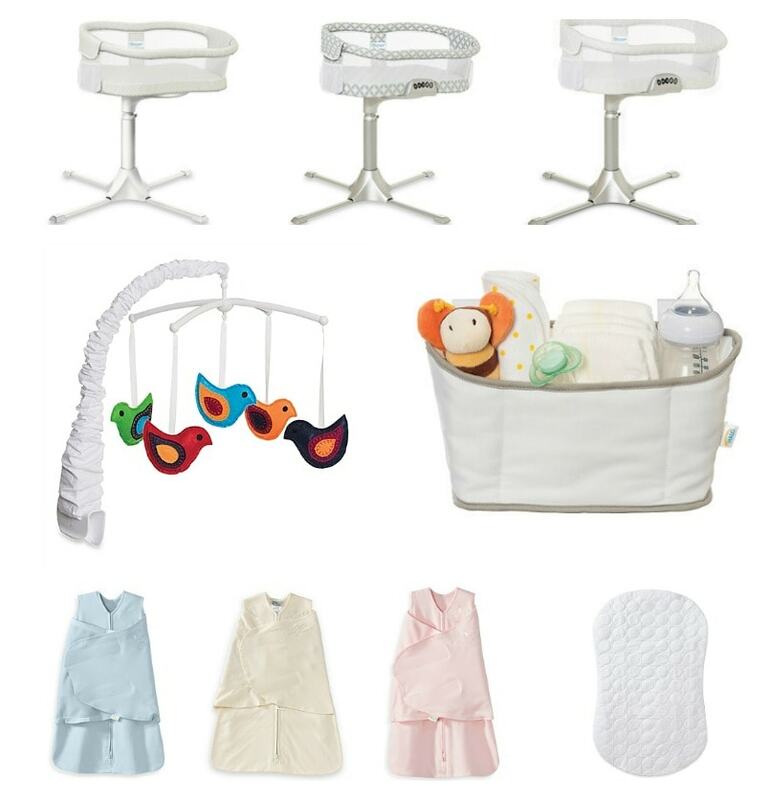 The Halo Bassinest Swivel Sleeper Mattress Pad Cover retails for $15.99, the Fitted Sheet retails for $14.99 and the Diaper Caddy retails for $19.99. In addition to the other great accessories described above, the sleep gurus at Halo also created a mobile to help create a colorful ambiance to lull your little one off to sleep. 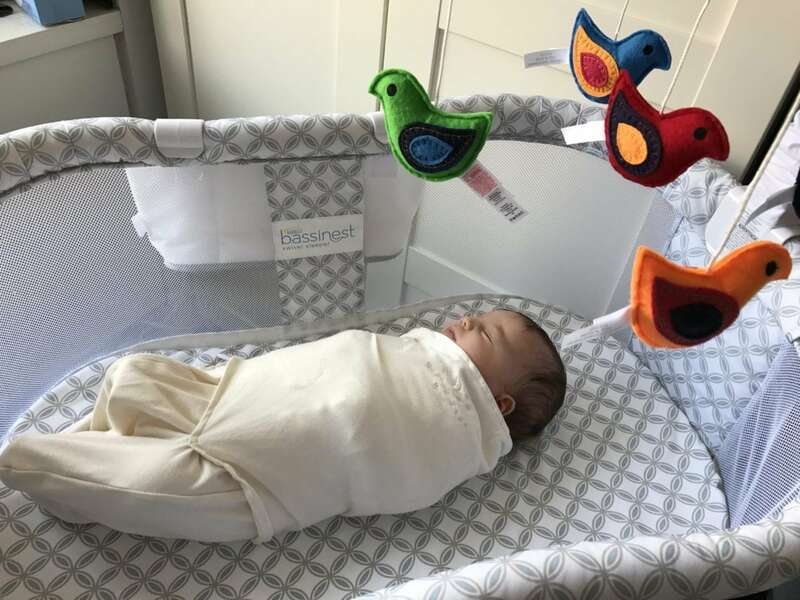 The mobile attaches to the Bassinest with a clamp and features a colorful assortment of owls or birds to stimulate your little one’s eye tracking and development. The Halo Bassinest Swivel Sleeper Mobile comes in Owls and Birds designs and retails for $39.99. I think it makes for a great addition to the Halo Bassinest. A great Bassinest Swivel Sleeper is a great start to help your newborn start building good sleep habits but to help your newborn transition from the coziness of the womb to sleeping on their own a great swaddle is a must have, and fortunately, the baby gurus at Halo have got you covered. The Halo SleepSack Newborn Swaddle is a 3-way adjustable swaddle that allows you to swaddle your little ones arms in different positions in and out of the swaddle so you can make them cozy and comfortable in whatever position they prefer. My favorite feature, however, is the fact that the swaddle can be unzipped from the bottom you can execute late night diaper changes without completely un-swaddling your baby so it is easy to keep them cozy and sleepy and get them quickly back off to sleep. As a bonus, the American Academy of Pediatrics recommends wearable blankets to keep babies warm while maintaining safe sleep practices. The Halo SleepSack Swaddle comes in a variety of colors and sizes and retails for $21.99-$24.99 depending on style. As a mom of a newborn, I love Halo’s commitment to creating a product that is both functional and designed with newborn safety as paramount. Safe sleep practices are the best means to combat Sudden Unexpected Infant Death (SIUD). Remember to always place baby on their back for nap time and overnight sleep, use a crib that is rated for overnight sleep with a firm mattress that fits snugly and covered in a tight-fitting crib sheet and remove all blankets, pillows, stuffed animals and bumpers from the baby’s sleep area. Sudden Unexpected Infant Death (SIUD) still claims more than 3,500 infants each year in North America. More than half of these deaths are preventable when proper safe sleep practices are followed. To help keep all babies sleeping safely and avoid these unnecessary tragedies, HALO is dedicated to putting the health, safety and well-being of babies first. In fact, over 1,400 hospitals use HALO® SleepSack® wearable blankets through the HALO Safer Way to Sleep Hospital Initiative. Through this program HALO has helped Hospitals and Birth Centers throughout North America create their own safe sleep programs, which utilize the HALO SleepSack Swaddle to demonstrate to parents and caregivers how to keep their babies sleeping safely. To date, HALO has donated more than $4.3 million in its efforts to promote safe sleep education. Sample of the Halo Bassinest provided for review. Opinions expressed solely mine.